Dry times in California are translating into overflow business for C-57 Well Drilling licensees. As a third year of drought appears inevitable statewide, water well contractors seem to have all the work they can handle. Anyone who needs to pump or increase their usage of underground water may need to take a number and prepare to wait in line if they yet haven't lined up a C-57 contracting firm, according to leaders in California's water well industry. "As an industry, we are very, very busy for obvious reasons," said John Hofer, executive director of the 400-member California Groundwater Association (CGA). "We are doing a lot of work right now." "We've got a year's backlog" of work, added Larry Rottman of Rottman Drilling Co., which is based in Lancaster but does water well work throughout the state and Nevada. "Honestly, I think we'll stay busy for another two years at least," said Brandon Burgess, drilling manager for Weeks Drilling & Pump Co., located in Sebastapol. "It has not slowed down probably since 2012." Without a doubt, this rush of business is being driven by the fact that California's surface water supplies are all but certain to run short this year. Snow runoff is far below average, and reservoirs have little reserve, causing more agricultural interests and developers to commission new, deeper wells to tap underground supplies or, in some cases, upgrade existing well sites to boost pumping capacity. "In a normal year in California, groundwater supplies 40 percent of all the water, while surface water supplies 60 percent," said Dave Landino, owner of Landino Drilling Co. in Davenport. "Those numbers are reversed now. Surface supplies are extremely stretched. There's a reliance on groundwater" to satisfy the same demand for water, Landino said. "Everybody has to have water," added Burgess, the Weeks Drilling manager. His company services a wide area that stretches from Humboldt County to the San Francisco area, but specializes in drilling around the Napa/Sonoma valleys. Burgess said most of Weeks' business comes from installing new wells. Older wells, dug using technology and materials that had a tendency to deteriorate, have been abandoned in favor of ones using newer, more resistant PVC casings. In addition, more water users "are trying preemptive activities," Burgess said. "The irrigation demands are about the same, but they're saying, 'let's get another well on line.' They're scared of new regulations, and running short of water." The search for dependable sources of water has led drilling companies to dig more deeply than ever. In the San Joaquin Valley, where water tables have dropped sharply, Rottman said that his firm has bored down to depths of 2,000 to 2,500 feet to find new supplies for farmers. Deep drilling techniques are essential in many municipal areas as well. In parts of San Diego, it's often necessary to drill 1,000 feet to reach water for domestic use, Landino said. While the specter of drought has been a boon for water drillers, the improving economic climate in California also has brought more business. Like their other contractor brethren, drillers suffered when the recession struck the state's construction industry. "It's an industry (water well drilling) that was badly damaged by the last recession because the housing complement has such a boom and bust cycle," said Dave Landino, whose firm works primarily on the Central Coast but consults around the state. Rottman said he was forced to lay off half of his staff between 2009 and 2010 when the work dried up, but has since hired those employees back. He employs 25 people in his Lancaster and Nevada offices. "It killed us," Rottman said of those dry times. "Most of us had lost money since 2008. The only thing that pulled us out of this mess was construction." Although business is surging for the water well drillers that CSLB contacted for this article, the industry faces many challenges. Drilling equipment is extremely expensive. Regulations—or the lack of them, say some—can add to the burden of trying to run a profitable operation. "California is quite a difficult place; you have to contend with a lot of regulations," said Hofer, CGA executive director. 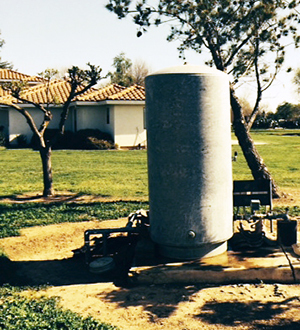 The water well permit process is done at the local level in California. Each county in California has an environmental health office, or public health department, that determines guidelines for drilling permits. After a new well is installed, or an existing one is reconditioned or destroyed, California requires that a well completion report be sent to the Department of Water Resources within 60 days. The state also publishes standards for well protection, modification, rehabilitation, destruction, monitoring, and cathodic protection. But local agencies may adopt and enforce additional standards. In addition, many counties have regional water boards that provide an additional layer of review and protection of groundwater supplies. "You really have to be up to speed on different area requirements," said Hofer, pointing to Monterey County as an area that has built multiple levels of governmental oversight to monitor groundwater issues. "It can be quite a morass." The water well industry, in conjunction with CGA, actively encourages continuing education for drillers, and standardizing a sometimes-confusing patchwork of local regulations. Landino, a past president for CGA, says he'd like to see that education extend to county officials in charge of overseeing water issues. He pointed to nitrate contamination of groundwater as a problem that requires a uniform strategy on the part of regulators. For example, Monterey County is a leader in efforts to protect wells from infiltration of nitrates, a known carcinogen found in fertilizers and animal waste, while other counties have not undertaken those efforts, Landino said. "If you can't supervise work in the field, you wind up possibly jeopardizing the groundwater," warned Rottman, another former CGA president. Another area of concern for CGA is the possibility of unlicensed contractors taking advantage of the surplus of well drilling work in California. "We are very concerned" about unlicensed drillers coming in from other states, Hofer said. "In the late '70s, during the last drought, a lot of competition came in from out of state, unlicensed, kind of ambulance-chasing. We had people here who had no business drilling." "These guys don't comply with anything and cause havoc in the marketplace," Rottman added. Along with the challenges and opportunities related to well drilling in California, there has been a slow but steady decline in the number of active C-57 contractors. In March 2010, CSLB statistics showed that 809 contractors held an active C-57 license. Three years later, that number dropped to 784. As of March 2014, there were 766 active C-57 license holders. Remember, only C-57 contractors are allowed to do water well drilling.